My favorite season is fall. I love how nature changes and the colorful display I enjoy every day. The light is warmer and not as harsh as in summer. I absolutely love the earthy color palette of fall. The fog returns and it’s not as hot anymore, but the days have lovely temperatures that still allow to walk around without a jacket and in sandals. 2. What season is it now where you live? Have you seen a visible sign of the season changing? We have summer right now, but already I can see the first yellow, orange and red leaves on some of the Chinese Pistaches. They are usually the first to turn and in October they are spectacular. 3. 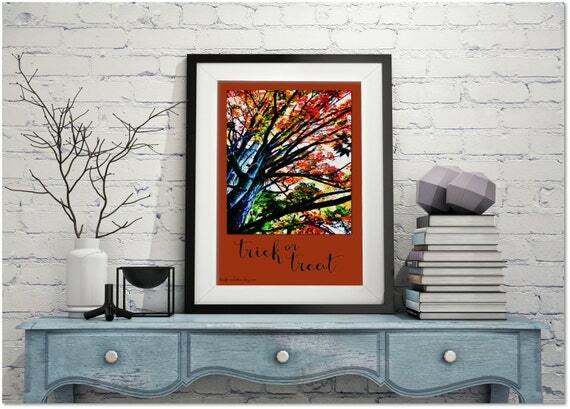 What item in your shop represents your favorite season and the story behind it? This journal represents the warm and earthy colors of fall. I personally love to journal and I especially like the smooth paper of composition books. Their sure are other people who share this and with them in mind I created this journal. 4. What seasonal traditions are celebrated in your part of the world? There are two big celebrations in fall in my part of the world: Halloween and Thanksgiving. Thanksgiving is my favorite holiday of the year. Here, in wine country, the harvest of the grapes is also very important and often accompanied by small festivals with music, food and, of course, wine. We asked our CIJ Teamies if they offered anything daring & different — and here’s what they shared with us. My daughter and I found this figurine vase at an estate sale. Normally, I would not buy an outhouse to list in our Shop! But, I thought it was funny that the bear was surprising the man inside and suspected someone else might appreciate the humor. I spent hours on-line researching and trying to find out when and where it was made–with no luck. Then it hit me–the guy inside looked like Teddy Roosevelt in his Rough Rider days! Bingo! The vase was made in Germany during the 1920s–vintage political humor! My pod pendant is definitely different + daring! It is my interpretation of a milkweed pod when it bursts open to release its seeds. It is a piece jewellery for a woman who isn’t afraid of bold statements and likes artisan work! This necklace is a one of a kind handmade piece of jewelry made by me. The lovely large orange Carnelian and yellow Citrine faceted rondelle gemstone beads make it look elegant! But I also think the bright, cheerful colors accented by the Sterling Silver sun pendant and clasp look somewhat tribal! The suns remind me of jewelry that the ancient Aztecs would have worn as they ascended the many steps of their stone temples to lead their tribe in worship ceremonies! There are also matching earrings in my shop with small Sterling Silver sun charms! This is definitely a statement piece for the woman looking for something unique and bright to give her outfit that special pop of color! I think all my items are unique. Everyone is so creative. If you live in the USA, then you know this is an election year. So, some time back I decided to make a variety of red, white and blue items to show my patriotic side. This is an acrylic painting, with an eagle, all done in red, white and blue. Perfect for a boy’s room, nursery or playroom. It is on sale too! Oh how much fun! I kind of dare to be different with all my jewelry but this one sort of put me a little over the top. This is an anatomically correct bleeding human heart. The heart is made out of PMC and I used natural cut rubies in the ends of all the veins and arteries to make it look like blood. This is a really unique one of a kind piece of art. This fabric design is not one that I usually work with. However, with Halloween approaching it has been featured on my sewing table recently! Many thanks to everyone for sharing these very cool items! If you’re one of those crazies like us who LOVES Halloween, you might be starting to get ready already! Also known as Samhain by some, this is one of the most magical times of the year. Samhain predates the Roman feast of the Dead, Lemuria, and All Hallow’s Eve – the eve of the Christian holiday to honor the saints, All Saint’s Day. The secular holiday today is known as Halloween. All of these festivals, despite their different names, focus on reverence for the dead, as well as a time to communicate with the deceased. What do you do to prepare for Halloween, or celebrate your special ‘Bewitching Hour’? We asked our CIJ teamies to share their stories and bewitching items that show their love for this special time, and here’s what they told us. No other holiday provides the fun and festivities like Halloween! Although we don’t sell anything specifically for Halloween, we love to see what the Etsy community delivers during October. From choosing the perfect costume to planning the perfect party, Etsy sellers have some of the best ideas around and shopping on Etsy is never more fun than it is in the fall. Go Etsy and get in the spirit! We love to go all out on our costumes, visit haunted attractions, and see the creative decorations in our community. After a long night of thrills and treats, kick off your shoes and enjoy your favorite spirit in style! We encourage responsible enjoyment of spirits in moderation and good company. Cheers to all of the responsible adults who make Halloween a fun and enjoyable holiday across the USA! We are American, and loved trick or treating when the kids were little. But we traveled around a lot and lived in countries where trick-or-treating didn’t happen. In those cases we would have a big fun Halloween party, inviting neighbors and friends of many nationalities who were all too eager to wear a silly costume, bob for apples and drink cider. The thing i love best about Halloween is making my grandchildren’s costumes helping them transform into whatever they can imagine every year they come to me with there ideas of what they want to be and we spend time together getting their costumes just right. I haven’t really ever been into Halloween as such. When I was young, occasionally people would come to the house trick or treating and we would give them some lollies. I don’t tend to celebrate Halloween but since many people do in other places I made these Halloween themed gift tags! I LOVE Halloween! My Dad used to make our costumes, carved the pumpkins, and thoroughly enjoyed the handing out candy to all the trick or treaters! I made these spider earrings to go along with a witchy costume on Halloween. My husband and I LOVE Halloween! When the kids were younger and we lived in town (we live in the country now) our house had the most creepy decorations around and people would drive from all over to see our house. We tried to do something different every year and it was a big event. The kids loved helping and now they decorate or do something similar at their own houses. Eventually we moved and now we live in the country so no one is around to see anything, I miss doing all the decorations so what I do now is decorate my Etsy Shop Banner, my Avatar wears a witch hat, and I also decorate other online places like Facebook banners, etc. Halloween was a fun time of year when my children were little! The selection of their costumes, parties at school and receiving greeting cards from family, all added to the excitement! We live in Michigan, so we always had to be prepared for cold weather while trick or treating—sometimes their costumes were covered by winter coats! I think people love Halloween because it is a fun way to be scared, and be someone else for a night. I love to see all the little ones in their cute outfits, and I love Fall décor. Since my kids don’t trick or treat anymore, we have to find other ways to enjoy the Fall holiday, so we decorate. I love Fall/Halloween décor, like my painted sugar skull plate. I absolutely love decorating for Halloween and live in a neighborhood where people enjoy decorating their yards and homes. I have always enjoyed creating my own decorations and have combined my love for vintage and Halloween into one this year! We’ve only started getting in to Halloween, as we’re in Australia. My daughter is 2.5 now and is beginning to discover the fun of dressing up, so I think we’ll really be able to enjoy it this year, but nothing too scary while she’s young. I created this invitation for those who like a spookier tone to their Halloween parties! We had such a GREAT response to this invitation to the blog! Many thanks to EVERYONE! We love the stories and the items! Every year kids and some adults dress up in costume for a night of trick-or-treating and revelry. We accept this as a normal behavior, but how did this tradition come to be? Halloween dates back to the ancient Celtic festival of Samhain. Two thousand years ago, the Celts, who lived in the area that is now Ireland, the United Kingdom and northern France, celebrated their new year on November 1. On October 31, they celebrated Samhain, the summer’s end, a day of celebration before the long cold days of winter, which brought the death of nature, life and the harvest. During the 16th century, this festival included mumming and guising, in which people would go door-to-door dressed in costume and perform a song or recite a poem in exchange for food. It is often thought that this tradition originally began with people impersonating the souls of the dead and received the offerings on their behalf. It was believed that wearing a costume would offer protection from these dead souls. It was thought that the mummers and guisers were the old spirits of winter and would give good fortune in exchange for a reward. The first recorded incident of children trick-or-treating in North America occurred in 1911. In order to conform to Victorian era morality, Halloween became more of a private holiday and only children celebrated the festival. Halloween was considered to be a rather dark and gothic holiday with costumes made at home. As trick-or-treating gained in popularity during the 1930’s the first mass-produced costumes became available. Most often, Halloween costumes depict a scary monsters such as vampires, ghosts or witches. Extremely popular are superhero characters and pop culture figures. Another costume trend are characters from our favorite movie or television show. My most memorable Halloween costume is Pammy Panda. My oldest daughter absolutely loved the animated series “Shirt Tales”, which aired during the early 1980’s. She simply just had to be Pammy Panda. I was unable to find this costume in any store, and was only able to come up with a sewing pattern. My skills as a seamstress have always been rather limited, but I gave it the old college try. It was the most complicated sewing project and Halloween costume that I have ever encountered. Lots of fake fur-lined with lined with silk for a head, shirt, pants, spats and mittens. It turned out adorable and my daughter loved it. She wore it every Halloween until she out grew it and still has it packed away. 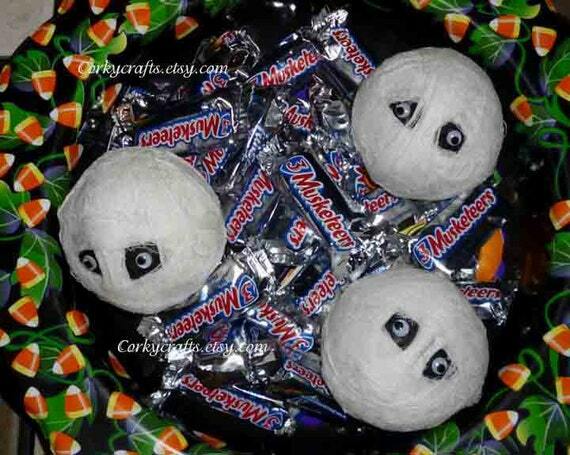 Every Halloween we smile and reminisce about our sweet little Pammy Panda. I asked the members of the Etsy Christmas In July Team to share stories about their most memorable Halloween costume and feature a costume or accessory from their shop. Halloween is my favourite holiday! My favourite costume was a simple one – the Wicked Witch, but it meant my last little dog, Taz, got to be my Toto and went trick or treating with me. I love making Halloween creations too. It’s hard to pick a favourite but I had great fun making these shrunken heads. 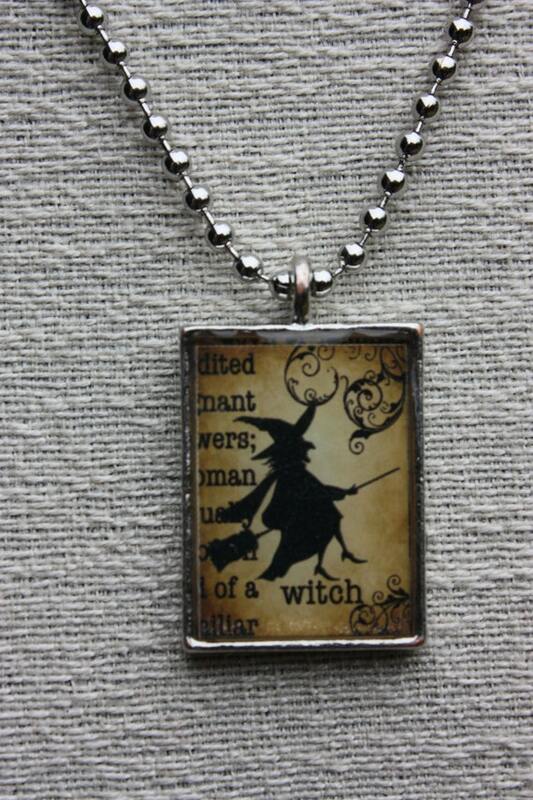 They can be worn around your neck – great for any cannibals, warlocks or evil spirits. When I was eight years old, I dressed as Raggedy Ann in a red checked dress and white pinafore. We purchased the outfit at a Hudson’s department store, near Detroit. It came with a matching doll that we recently sold in our Shop! My favorite costume was last year when I dressed up as Janis Joplin. Well, it was an aging Janis Joplin! LOL Bell bottoms, beads. fur vest, huge round sun glasses, and a long streaming head band. Got lots of comments! These are perfect for a gothic look on Halloween. 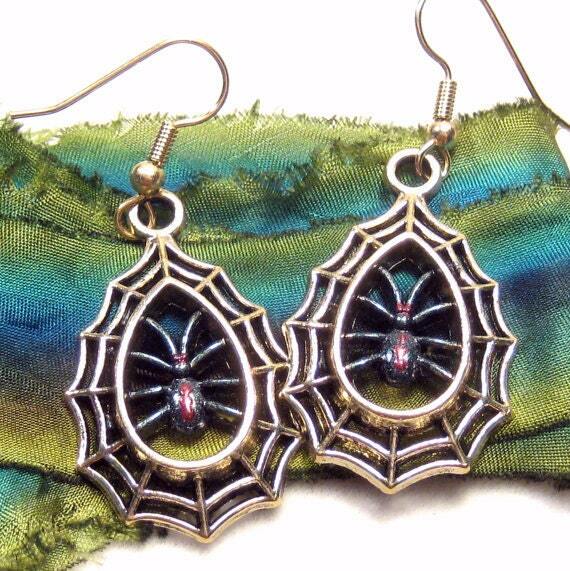 Earrings with gold tone webs with a black widow spider in the center. I love dressing up every year… but my favorite costume of all time had to be one that my beloved mother made for me when I was in the 3rd grade! My mom made a Raggedy Ann and Andy costume for me and my best friend to wear and we won first prize at school. Our “hair” was made out of red crepe paper that my mom had stitched into a wig. Later that night when we went out to do our trick or treating, it began to rain and the dye from the red crepe paper went streaming down our cheeks… the end result was a rather scary sight – we looked like we had blood running down our faces! As long as I can remember, I’ve always loved Halloween. I grew up along the bayou of Southeast Louisiana. When I was young, my family would celebrate Halloween with a bonfire. We would congregate by the bayou, dressed in our costumes, and light the bonfire. Then, we would spend the night eating, drinking and telling creepy tales. Looking back, I believe my favorite costume was my black cat outfit that my Mom had made for me. As you can see by my shop name and avatar, I love cats. 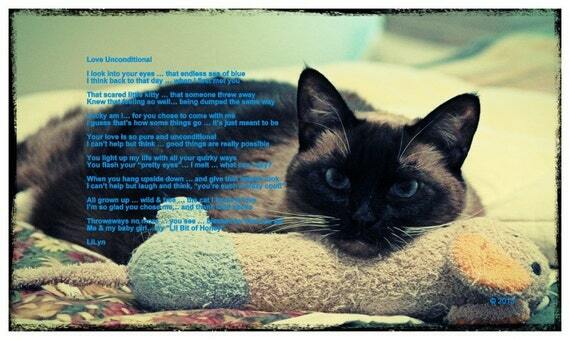 I chose to include this poetry art print because the cat is actually my cat/avatar and part of my family. And also she reminds me of my black cat costume. My most memorable Halloween by far was when I was about 10. I had made my own green alien costume out of my older sister’s old Jazz dance costume. We had a Halloween party with lots of friends and had a blast complete with apple bobbing and pumpkin carving and costume contests and spooky decorations like a skeleton candle. Since there are 7 kids in our family and we all invited lots of friends, the place was pretty noisy and festive. At one point we forgot about that darn skeleton candle and the wooden dining room table caught on fire. The fire department came and quickly put it out while we were all standing outside. Which made it the most exciting Halloween party ever for all us kids and our friends, much to my mother’s dismay. It was interesting though how the skirt on my oldest teenage sister’s costume managed to get a little shorter when the fire department arrived. My parents bought a new refrigerator when I was 9, well guess what my costume that year ? I was a computer, I painted the box and gave out printed thank yous when candy was dropped into the slot. It was hard to see thru the holes I got tangled into tree limbs because the box was so tall. My parents love telling me that story of not losing sight of me because of a giant box walking down the street. Every year our acreage becomes the haunted forest, and we don our headless horseman costume & ride the horses to greet our trick or treaters and the kids love it. It’s annual haunted festival. Each year I create mummy heads for my ghosts and goblin (nieces & nephews) when they come to visit – and now offer them in my shop. How can anybody refuse 1 night a year to be a kid again in costume? With Halloween quickly approaching, chills are in the air, blustery winds are sweeping up the leaves left on the ground and swirling them around midair, before carrying them off to a place no one knows. Things creep in the bushes at night and a thick fog lays itself on the field behind the old farmhouse up the lane. First you catch the aroma in the air, the scent of the witch. A rich pumpkin lager mixed with a sultry rum and exotic spices hangs thick in the air as women clad in black hang by the potion shops before seemingly disappearing before your eyes. The moon is high in the sky as nightfall approaches. It is full and bright. Shadows fly across it and you blink. Was that a broom? No, your eyes must be playing tricks on you. It was a cloud. Moving so quickly? Couldn’t be. Perhaps they were just some bats. It’s probably best to be heading home now. It’s been dark a while, the air is thick with mystery, and the animals are on the prowl. You flip up the collar of your black wool coat to keep the wind out and your boots click down the sidewalk. Thoughts of witches are tossed from your mind with the flick of your head. Nonsense. Waiting for you on the stoop, however, a slinking black cat. You don’t own a cat.